Elk Ridge eighth grader Chris Patterson said at the beginning of the school year, he was timid around girls. “I basically didn’t say much or know what to say,” he said. Then, after signing up for a free afterschool ballroom dance workshop last fall, it forced his hand. “It got me to talk to my partner and then, I got used to talking to girls and interacting. Now I enjoy being with other people and I’ve always liked dancing. I knew I could move my feet, but I didn’t know anything about ballroom. It’s like a sport, but with more focus and responsibility,” he said. Ballroom dance at Elk Ridge Middle School began in 2007 under teacher Megan Rees, who directed the program for three years before taking time off from the afterschool activity to spend more time with her young children. In her absence, Darleen Gordon kept the program alive until Rees returned to the program this fall. More than 75 students signed up for the workshop in the fall, where for three weeks they learned dances twice each week for an hour at a time. Assisting Rees is her former student Brent Arthur, who started a ballroom club at Bingham High when he was a student there, and now volunteers his time with middle school students. “Each week, we’d learn different dance steps as an introductory to ballroom — to see what it is, to see if they liked it,” Rees said. She taught the students swing, cha-cha, waltz, rumba, samba and West Coast Swing. In late September, after holding auditions, she announced 10 couples to the school team. The team included one seventh grader, eight eighth graders and 11 ninth graders. However, Rees saw more opportunities for the students and held a community dance event that included performers from Herriman High School, United Dance Artists, Alta High School and other touring dance companies. They also began teaching at local churches and groups, including the Murray Arts Center, and also performed in Herriman High’s concert on April 8. Many students also performed the tango in the school play, “Beauty and the Beast,” in February. In March, she held a second ballroom dance workshop and had 104 students participate in the eight-week lessons. 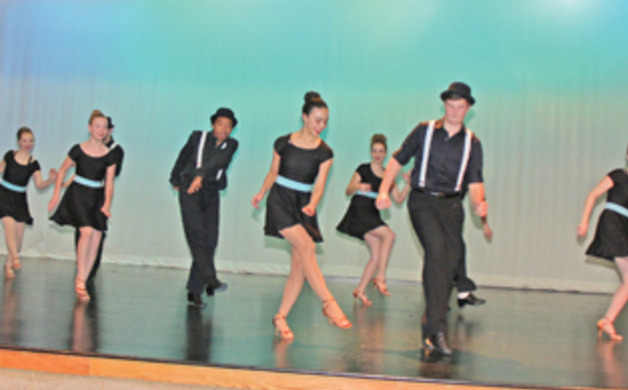 Students learned the cha-cha, swing, waltz, tango, mambo, fox trot and samba. Auditions for next year’s team will be held in May. “These students are dedicated to come after school, wanting to learn these steps when there is no credit given to them,” she said. However, Rees said the students learn more than just dance steps. She remembered learning ballroom from her neighbor, who was on the Brigham Young University team. Through it, she overcame her awkwardness in the middle school years and became more comfortable with who she was as she gained confidence. “I learned how to become more social and that changed my personality. As a girl, I learned how to follow. For boys, nothing teaches you how to be a man like ballroom. They need to learn how to lead, be strong, think ahead and plan and know what to do. It gives students a chance to learn how to interact socially and they learn dances they can use the rest of their lives. When I first introduced it, many students didn’t know what it was, but now they do and are eager to learn,” she said. When Chris was named to the dance team, he was so “excited that I ran home and told my mom,” he said. His partner, Amanda Hornberger, who recently moved to the school from Vancouver, Wash., said she saw the team perform and it looked like so much fun that she decided to audition.